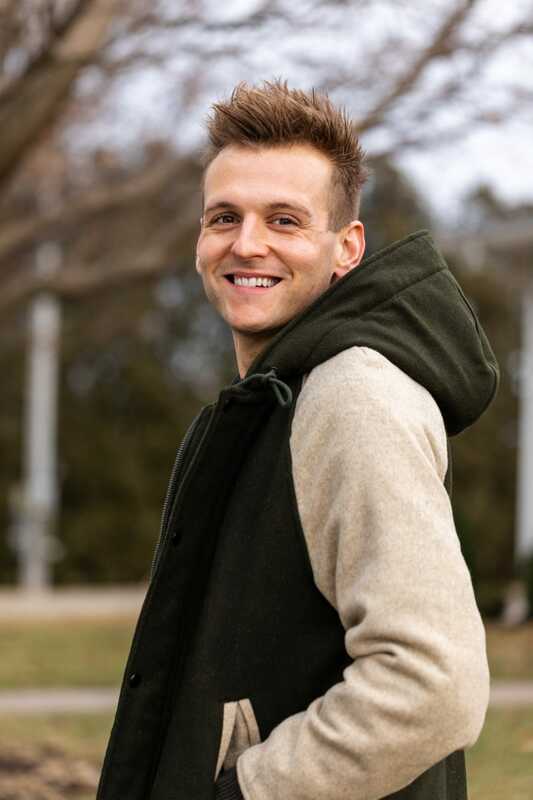 I grew up on a farrow to finish farm. We birthed the pigs and raised them until they were old enough for market. This gave me a very real “Circle of Life” experience and at a young age, I always knew where babies came from. This also meant that we ate pork at many meals. Our deep freezers were always full of different cuts of pork. Mom was such a whiz with all of them, bless her heart! Roasted pork tenderloin, grilled pork chops, sausage, pork burgers: the list of her creations, experiments and failures (only sparingly!) goes on and on. To her credit, a menu was always planned around what meat we were planning to have. In my own grown-up life, I don’t really cook like this as often as Mom did. I find myself more vegetable-centered most of the time, reserving the preparation of a meat dish for special occasions or when friends are headed my way for the evening. When I do prepare meat as a main dish, I want to make sure it’s enjoyed to the fullest, flavored and cooked to perfection. 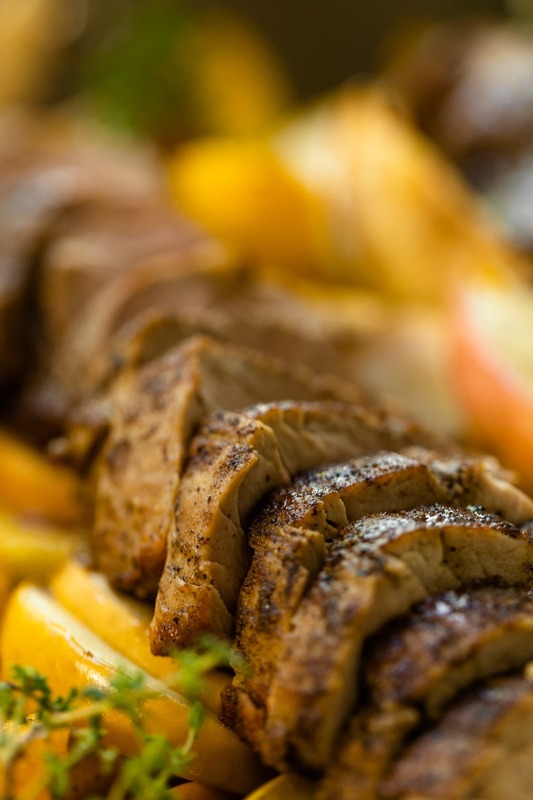 A roasted pork tenderloin is one of my favorite cuts, probably because it’s the most tender part of the loin. And it cooks quickly, which is a total plus in my book. 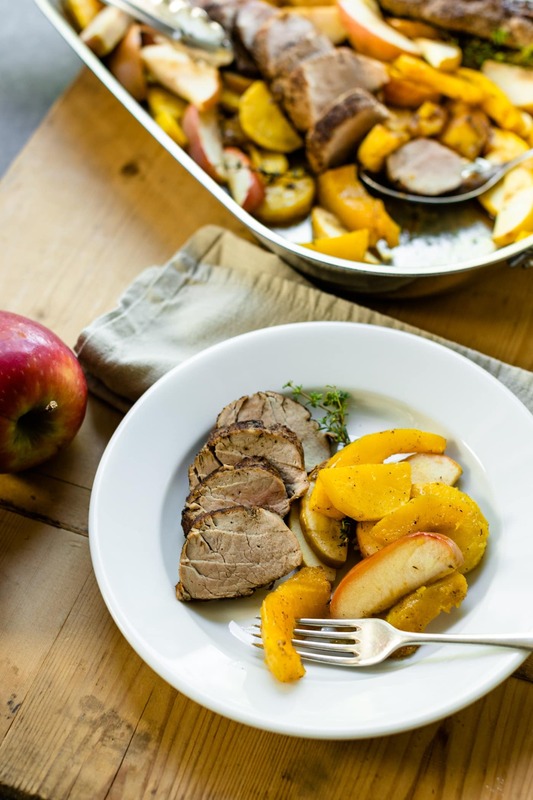 For this recipe, I wanted to really drive home the idea of the fall season, so what better to pair with the pork than a mixture of apples and squash. While they take different roasting times, when three three are paired together, they’re such a delicious mixture of sweet and hearty. Just look at the “crust” that spice rub adds! YUM! You can totally have this meal ready in way less than two hours for a special occasion or on an ordinary weeknight. Roasted pepitas – they’re so good and so easy to make! 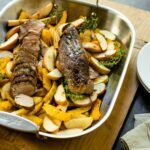 With a fall spice blend, this roasted pork tenderloin is a delicious, light meal for any weeknight. 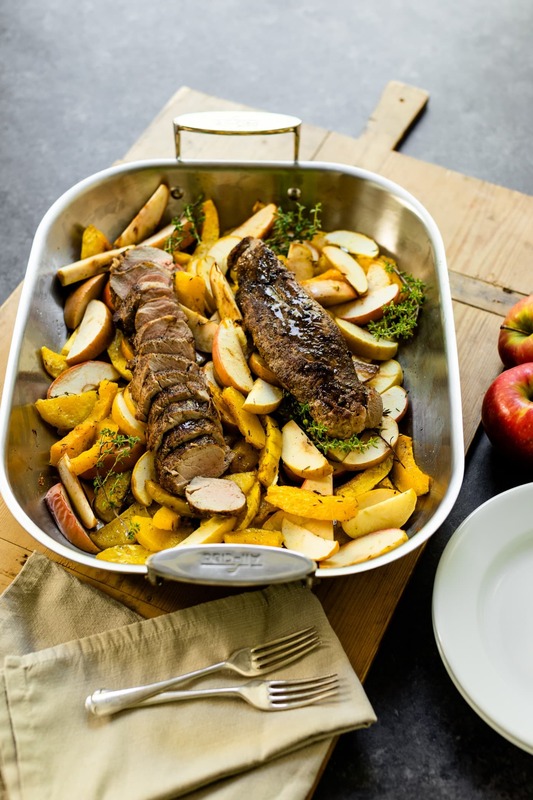 Since apples and squash are in season, they provide the perfect side dish, all baked together! Peel the squash, slice in half lengthwise and remove the seeds. Cut into 1/2-inch slices and place in a roasting pan. Drizzle with olive oil, salt and pepper. Mix to evenly coat the squash with the oil and spread in an even layer. Add the thyme sprigs. Roast in the preheated oven until the squash just begins to become tender, 20 minutes. While the squash is roasting, prepare the tenderloin. In a small bowl, combine the salt, pepper, garlic powder, onion powder and cinnamon. Stir to combine and sprinkle all over the dry tenderloins. Rub into the meat, picking up any fallen bits. In a large 12-inch skillet, heat the olive oil over medium high. Once the oil is shimmering and hot, sear the tenderloin until browned all around, about 3-5 minutes on all four sides. Remove from heat and set aside. Cut apples into quarters and remove core. After removing core, cut each quarter in half again. When the squash is just beginning to become tender, remove from oven and add apples. Stir to combine and spread in even layer. 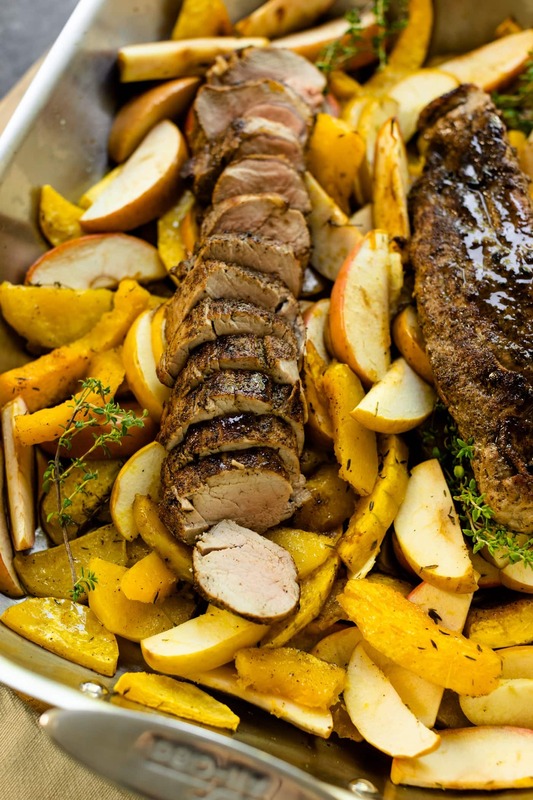 Add seared tenderloin on top of squash and apples, adding any juice that gathered under the meat. Continue to roast until the apples are tender and the pork registers 145 degrees, about 20 minutes. Remove from oven and let rest for 10 minutes. While resting, prepare pan sauce. Heat skillet over medium high for 2 minutes. Add apple cider and bring to a boil. Turn down to a simmer and scrape the browned bits from the bottom. When the apple cider is reduced by half, about 3 minutes, turn off the heat and whisk in the Dijon mustard and butter. Whisk until smooth. Cut pork and pour the pan sauce over the cut pieces. Serve with the squash and apples.